Our badge honoring the blog is in the right margin. I encourage all of our followers to click on it to be taken to the LexisNexis labor and employment law community, where you can read the press release. Now the fun really starts, because we’re in the championship round! 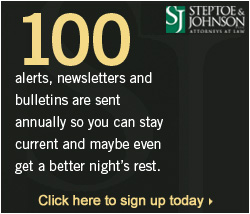 Now that we’ve been selected as one of the top 25 labor and employment blogs of 2011, we can’t stop there. We need all of our readers to vote for us again and again and again in a quest to make us the TOP labor and employment blog of the year! In the press release, there are links in the article which take you to the place where you can vote for us. You need to be registered to do that, so if you haven’t already registered in order to vote for us the first time around, please do so now. It should only take a minute. Once you’re registered, please take a minute and continue to spread the love for us by nominating us as the #1 labor and employment blog of the year. Voting ends next Friday, September 30, so speak on our behalf soon and often! On behalf of all of the Employment Essentials bloggers, we appreciate your loyalty and readership, and hope that you regularly visit this blog for all of the best labor and employment news, views and content in Appalachia and the nation.